1. 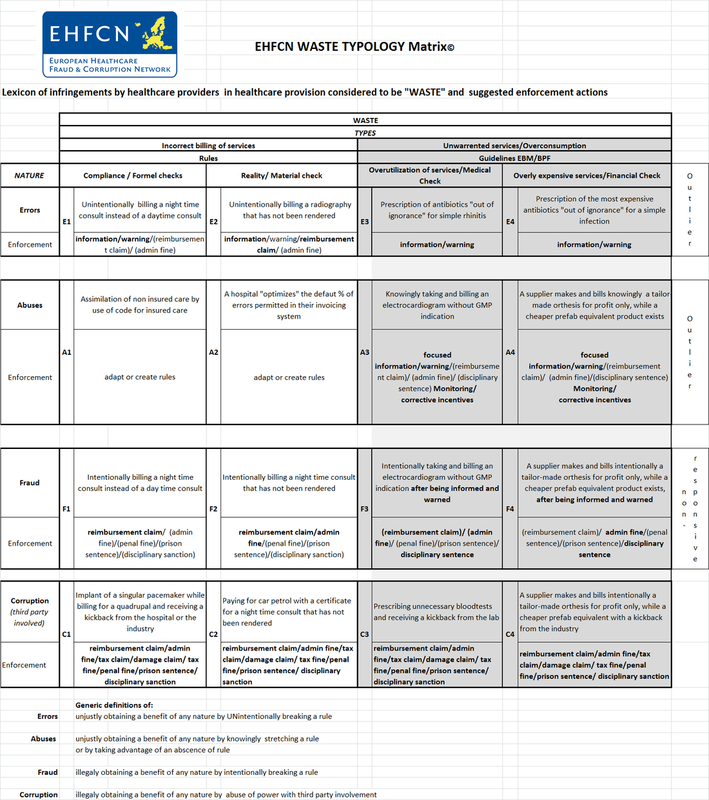 Context: how was the EHFCN Waste Typology Matrix© created? 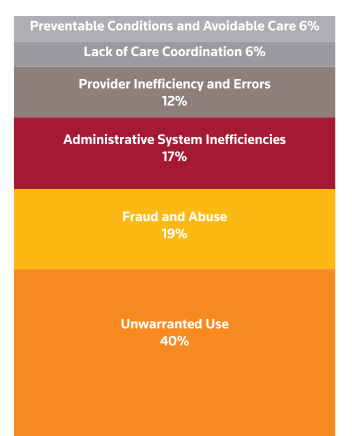 Between 2005 and 2009 the EHFCN focused on fighting Healthcare fraud and corruption. Those two words referred to all abnormalities that an anti-fraud and corruption service could encounter. No distinction was made according to the type (falsification, mistake, misuse, reality problem, overconsumption, non-conformity,…). The fact is that making a link between the terms fraud, corruption and Healthcare would have been taboo at that time. The EHFCN did everything it could to address this taboo and to raise awareness about this reality. The EHFCN also made it possible to set up a network of anti-fraud and anti-corruption departments and to promote information exchange about best practices. Exchange of analytical data remained difficult since the concepts of fraud and corruption were too wide to be subject to a precise comparison. In 2009 the Thompson – Reuter Agency published an important report on waste in the Healthcare expenses in the USA. The amounts mentioned (700,000 billion dollars) were big enough to raise an important awareness in the Healthcare sector. Finally all actors of the Healthcare sector were provided with a common denominator divided in 5 chapters. It was easy to use to communicate and it made it possible to classify the abnormalities detected by the Inspection departments. The Presidency of the EHFCN changed in 2013. Dr. Hepp, the newly elected President, found the ‘waste’ concept very interesting. He decided it would be the third aim of the organization. He immediately initiated a Think tank for the Member States about the lessons that the EHFCN could draw from the findings reported by the Thompson – Reuter Agency. The concertation that took place in 2013 and 2014 resulted in the EHFCN Waste Typology Matrix. Thanks to this typology the abnormalities can be described very precisely: they are defined (mistakes, misuse, fraud and corruptions) and the type of situation is mentioned (invoicing rule violated, needlessly expensive or unnecessary service). The EWTM is a good basic document. Thanks to its analytical method and its nuanced definitions the communication will improve and the Inspection Services in charge of the struggle against waste, fraud and corruption in the Healthcare sector will be able to set better targeted aims. No doubt that it will be assessed and improved in the future but at least it exists and it contributes to the continuous improvement of the best practices guidelines for the Inspection Services. From the very start of the creation of the Network it was clear that there was a semantic confusion when notions such as fraud, abuse, error, corruption etc. were being used by the members, not only when exchanging information but in particular in the context of reporting on their counter fraud activities. Moreover internationally there seemed to be a compulsive tendency not to mention the word ‘fraud’. Euphemisms such as ‘inappropriate use’ or ‘wrongful billing’ increased the semantic complexity of the jargon. When in October 2009 the Thomson Reuters report introduced the notion ‘waste’ in healthcare, defined and even quantified it, this increased the confusion at the one hand but at the same time this was the impulse for what was going to be the EHFCN Waste Typology ©. Waste is a clever container concept for a whole series of phenomena causing financial losses in healthcare. According to the New England Healthcare Institute waste is ‘Healthcare spending that can be eliminated without reducing the quality of care.’ According to Thomson Reuters ‘waste’ can be distinguished in different categories of which fraud, abuse and unwarranted use or overconsumption account for more than 59 % aside from administrative system inefficiencies, medical errors, lack of care coordination and avoidable care. In 2012 EHFCN has added ‘Waste’ to its scope aside from fraud and corruption. It was time to clarify the anti fraud jargon and EHFCN has tried to do so by creating a ‘waste typology’ defining the different categories of fraud, abuse and unwarranted use. Offenders are being called ‘outliers’ and ‘non respondent outliers’ are outliers who have not adapted their behavior after being informed and warned. The matrix provides an example for every possible infringement based on real cases identified with codes (F1, E3 etc) and for every case an action to enforce the rule or guideline is suggested in a progressive and sustained manner.